SHADO - Network's UFO Blu-ray now shipping! Network's UFO Blu-ray now shipping! Hey, people are getting emails from Network that their pre-buys have shipped! Haven't heard anything about Amazon.uk shipping yet. Re: Network's UFO Blu-ray now shipping! amazon.co.uk says: "Will despatch 15 Nov"
I, personally, had problems with network's provider on Space: 1999 season 2 box, so, having that in mind and their shipping being off the chart expensive, I have decided on amazon.co.uk... No posters, postcards etc, but I am sure set will be here as soonest and safest (and most affordable) as possible. Really, on the 15th? I would have thought they'd ship sooner than that. But I imagine people in the UK may start getting theirs as soon as tomorrow? Network has posted that the first pressing of their UFO Box has sold out, so any new orders will be delayed. I wonder what that means for Amazon.uk pre-order and HMV in-store copies? I'm seeing reports that Amazon.co.uk is now shipping the UFO Blu-rays, with some people expecting delivery tomorrow / Monday. Pre-ordered from Amazon UK too at £62.99. No confirmation e-mail yet, but will update the Thread when I get one. Great! My email from Network (FedEx, actually) indicates it might arrive tomorrow here, so evidently that expensive shipping is overnight international shipping! Wow, you guys are dedicated! It's free shipping here with Amazon UK. Anyway, I checked my bank account earlier today and it looks like around £37 has been taken out, plus checking my Amazon account shows that they're, "Preparing for despatch" and I've been given a delivery window of November 17-19. Subject: [SHADO] Re: Network's UFO Blu-ray now shipping! Nevermind. Seeing as I only see posts to the group via email, it sometimes gets confusing reading a reply without knowing what it is a reply to (no quote). 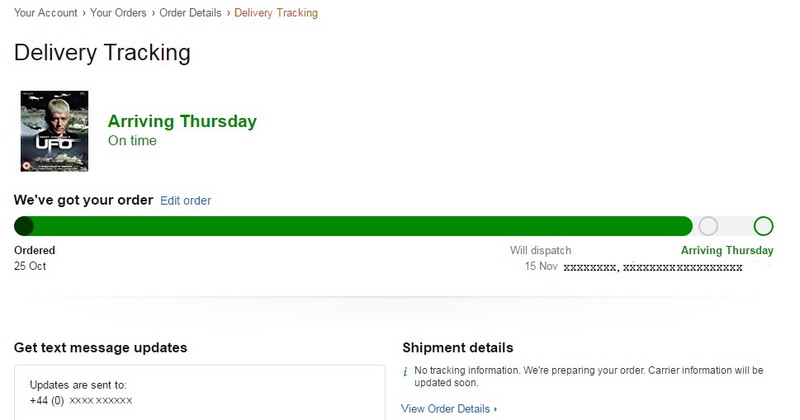 Got my message from Amazon UK - item shipped and due to arrive this Saturday! But apart from the less than satisfactory picture restoration and the fact that the discs tend to be difficult to get in and out, what are the general thoughts on other aspects of the set? Which aspects are you interested in? There are quite a few special features to go through still, at least for me. There is about 40 minutes of "raw footage" that is interesting to me, although I suspect some might find it dull. The documentaries seem a bit slapped together, not nearly the same caliber as the old Fanderson documentary. The photos galleries are mostly taken straight from Rex features, although there are many photos taken from Gerry Anderson's personal collection that have never been seen before (although none of these galleries take up the full resolution of the HD picture, which is kind of disappointing). "Unfortunately, the picture quality on this new Blu-ray is not up to the marketing claims, and often falls short of the previous Blu-ray (German, Japan) and DVD releases. The problem is that detail has been noise reduced away, to the point where detail visible on the DVD cannot be seen on the Blu-ray! Also the image is often overly bright and washed out, or there are color casts that have not been removed, or there is cropping along all 4 edges. I take it that nobody from BBC Resources was involved in this restoration? And hence the problem, it compares poorly to the DVDs previously remastered by BBC Resources for all aspects except resolution and bitrate. Also, there seems to be a fault in the restoration of TIMELASH, as if a linear gradient darkening has occurred on the bottom half of the image for several scenes.